Both courses adhere strategically to a basic Nicklaus philosophy: provide ample driving room but increase the difficulty in and around the greens. The courses share other characteristics such as bent grass tees, fairways and greens. Juniper and pinon trees line the fairways to create a sense of privacy, yet do so without obstructing the beautiful mountain vistas. 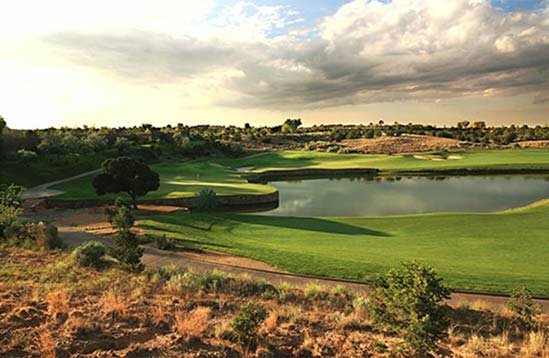 The Sunset Course, par-72, 7,517 yards, is more dramatic and challenging, with narrower driving areas and steeper bunkering to match the topography. The opening hole at Sunset is a strong but downhill 460-yard par-4, while the 13th is a 197-yard uphill par-3 with a deep left bunker and another shallower bunker on the right. “The par-3 holes are incredibly strong, very well done,” says Ben Crenshaw, a two-time Masters champion and a first-rate course designer. Nicklaus himself is partial to the par-4 second on Sunset, a 486-yard dogleg right with a natural arroyo, or washout area, along the entire right side, trundling slightly downhill to a green with a bunker also on the right. Facing straight west, it offers some of the best views of the surrounding area. On Sunrise, the par-5 sixth hole, 589 yards, is another personal favorite, with a choice of a split fairway on the second shot, with the right fairway offering the best angle to the benign green, but also a more harrowing shot that crosses an arroyo.